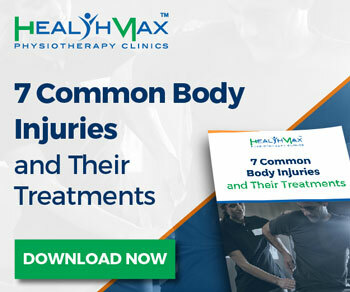 With tailored treatments specifically designed for your needs and dedicated healthcare specialists, HealthMax Physiotherapy in Brampton is your answer for a swift and comfortable recovery. Our team has experience treating a range of conditions related to concussions, back pain, chronic pain, neck pain, arthritis and more. We also offer various alternative treatments such as aquatic therapy, acupuncture and nutrition counseling. At HealthMax Physiotherapy, we believe in educating and empowering our patients through the recovery process. In support of these efforts, our Brampton location also offers a number of different orthotics and braces that are customized to meet your specific body type and nature of injury. Are you suffering from a recent injury? Injuries can be debilitating, but they don’t need to be. We develop specifically tailored solutions from our team of sports physiotherapists. The solutions we offer factor in your body’s unique traits, the injury you’ve suffered from, and your existing lifestyle to ensure the delivery of a high quality customized solution from our local physiotherapists in Brampton. This means there are powerful answers to your problem close to home. We’ll specifically target the heart of your pain and create an exercise program that empowers you to recover as quickly and completely as possible. Because we factor in your lifestyle, we’ve ensured that the plan we create is achievable for you. Our team of health care professionals at the HealthMax Physio Brampton clinic hold a strong commitment to our patients. Our main priority is to figure out the best treatment plan for you and get you back to optimal health. We begin by developing a specialized treatment plan catered to your individual needs and lifestyle. An initial medical assessment with one of our specialists will help us develop the best recommendations including a comprehensive, integrated course of treatment. We have an innovative team that, using specific techniques and treatments, are able to manage and prevent a range of injuries caused by things like illness, slips and falls, or other injuries. Why seek treatment from our Brampton Physiotherapy clinic team? Our Brampton physiotherapy team provides a tailored treatment plan based on your condition. We leverage a multidisciplinary team of healthcare professionals to provide you with complete care. We use a proactive approach to get you back to your optimal health and prevent future injuries. If you’re suffering from pain and are ready to start getting your life back in order, contact us today to schedule an initial consultation and begin the process of restoring your body to its optimal condition! Be sure to ask about our full range of services such as Shockwave Therapy and more! If you are suffering from pain and are ready to start getting your life back in order, contact us today to schedule an initial consultation and begin the process of restoring your body to its optimal condition! This is an amazing clinic! The front desk staff is extremely welcoming. I have been a patient at Healthmax since 2010 and still go in for maintenance on my back. I have been treated by both Dr. Badwall and Dr. Iqbal. Both of them are extremely skilled chiropractors and have the utmost empathy for patients going through pain. They show you care and are very accommodating with your schedule. The physiotherapist is very good at what she does and has fantastic people skills. The clinic is clean, and up to date in regards to their treatment technology. I would recommend this clinic to anyone seeking help with an injury or maintenance of good health!! Heard about the clinic through friends and I am so glad I had! Dr. Badwall and his team are very professional and up to date with their therapies. I had chronic shoulder pain and Dr. Badwall was able to help me return back to function. He genuinely cares about his patients and wants to get people better. I would recommend Dr. Badwall and his team to everyone!!! A team of caring professionals with polished diagnostic and therapeutic skills alongwith organized, accomodating and cheerful staff. I have been seeing Dr.Badwall and Dr. Iqbal for neck and back issues. Relief is instant and long lasting with the treatment techniques applied. Iwould highly recommend seeing the health professionals at Healthmax Physio Brampton for any acute or chronic conditions one may suffer from. I have been seeing Dr. Badwall for the past 6 weeks regarding a shoulder dislocation that occurred as a consequence of a sports related injury. I found him and his staff to be very friendly, organized, and professional. Despite having had only 3 treatments thus far, I already note improvements in my range of motion and level of pain. Dr. Badwall uses state of the art techniques to facilitate and expedite recovery. Needless to say, I have been thoroughly impressed and feel confident that with his help, I will make a full recovery.